I was at Collectormania, a twice-yearly signing event held in Milton Keynes for film and TV fans, on 5 May 2007. 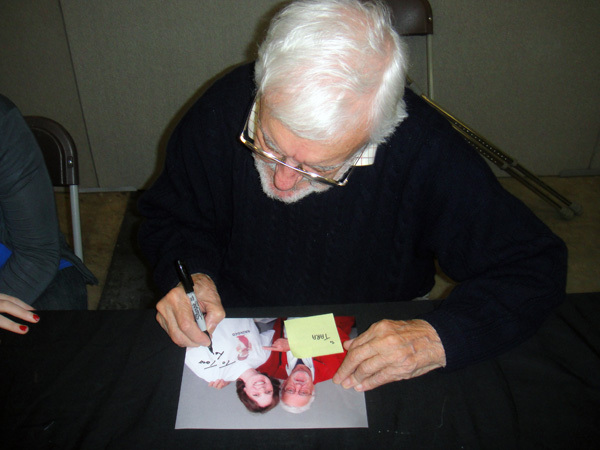 It tends to focus on the sci-fi and fantasy genres, and Bernard was signing a lot of autographs for Doctor Who collectors, as he starred in the 1966 film Daleks’ Invasion Earth: 2150 A.D. I was disappointed to find that there were no Wombles photographs available for signing (an 8″x10″ promo photo was included in the £15 autograph charge, though you could bring your own items to be signed instead). So, passing up some rather bizarre shots from Carry On films, I chose a straightforward posed picture, which the lady selling the tickets explained was from Jackanory – Bernard presented a record 111 episodes over the years. 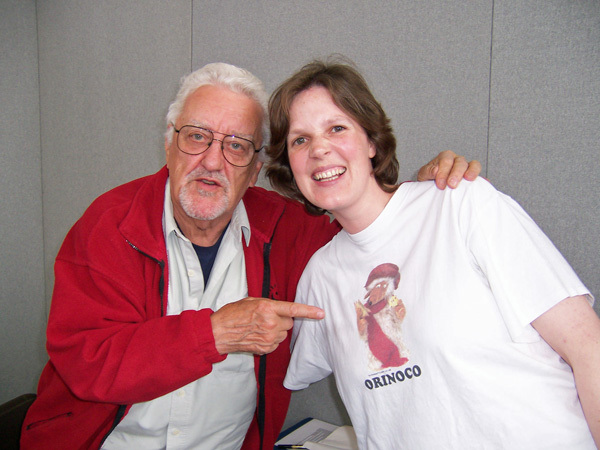 When Bernard Cribbins was announced as one of the guests at London Film & Comic Con, on 8 July 2012, I couldn’t pass up the chance to meet him again. Again there were no Wombles-related promo photos on offer, but this time I’d come prepared, with a printed copy of my photo from Collectormania. Bernard seemed amused as he scrutinised my picture. No doubt it made a change from signing prints of Wilf Mott, his much-loved character in the recent Doctor Who series with David Tennant. I explained that it was from Collectormania five years ago in Milton Keynes. Later in the day, I joined the queue for Bernard’s official photoshoot. It was nice to spot a fellow Wombles fan queueing with her young family, armed with Wellington and Madame Cholet toys. As he was on crutches after a knee operation, Bernard sat on a high stool while fans took turns to stand next to him for their photo. “Not another one!”, he joked as I approached with my own cuddly toy, asking him, “Would you like to hold Orinoco?” Before I knew it, the photographer had finished and I was moved along. When I collected my photo later, there he was, pointing again – but this time pointing at the Orinoco toy. See you again in 2017, Bernard!